The Word On The Streets! Word on the street is that no one has completed the full curriculum yet. So, I figured, I would start a new thread on this quote. Why hasn’t anyone finished the FCC curriculum yet? Its to difficult to learn. campers just fell off track. Or maybe, it’s all the above, or none. Personally, I don’t know, but I do want to know why! Probably, other campers would like to know, as well. I like the word on the streets. I’m pretty sure I see every month on the FCC Summit Live Stream at least someone presenting their non-profit projects in which they team up with another person who’s already completed the curriculum. It’s a small number but I’m sure people have actually completed the curriculum. Some people drop out after they get a job or get frustrated at something. I’m going to do some research on this. Technically, you have to complete 4 non-profit projects to earn the final cert. 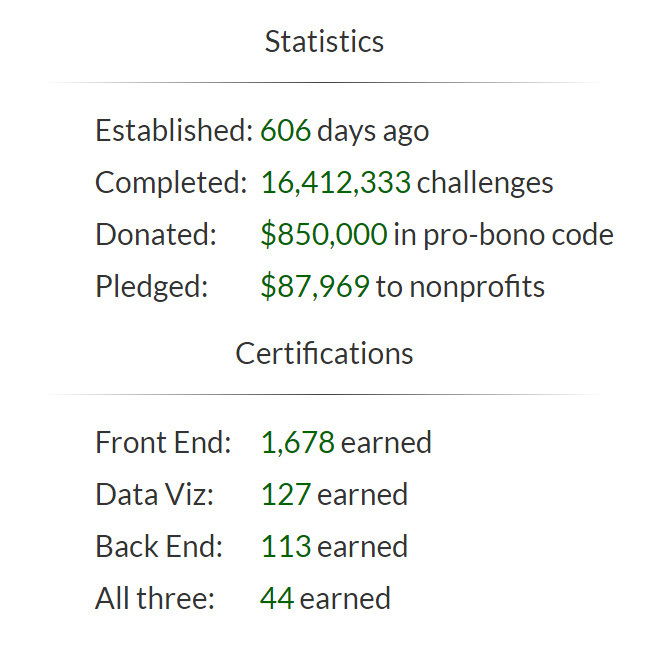 There have certainly been people that have worked on non-profit projects, but I don’t think anyone has still earned that final cert. Quincy mentioned a while back on a podcast or two that many people go on to find jobs before finishing, so that would account for the successful students that don’t complete. There is also a pretty high churn rate of people that find it too hard or not quite the right time for them to commit - which makes sense, since anyone can start for free, but it takes determination and drive to complete any of the certificates.